Sweet and spicy! 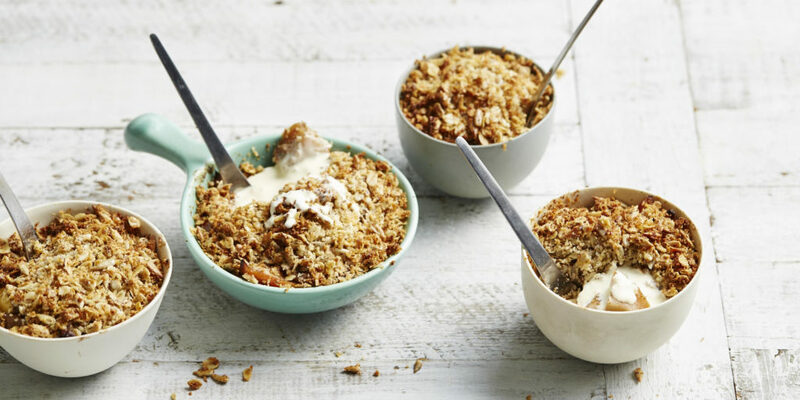 The parsnip is this apple crumble adds a nice earthy sweetness, which pairs perfectly with a little nutmeg. Top with your favourite crunchy things and bang into the oven until toasted. Serve with a dollop of cream or coconut yoghurt for the perfect easy dessert. 2 large red apples, cored and diced. 200 g heavy cream, to serve. 2. Add apples, parsnip, butter, allspice and rice malt syrup to a medium-sized saucepan. Place saucepan over low-medium heat. Cook for 10 minutes until apple softens. Place stewed apple and parsnip into the prepared baking dish. 3. To make the crumble, add all ingredients to a large mixing bowl. Toss until the butter coats everything. Scoop the crumb over the apple evenly. Place crumble into the oven and bake for 10 minutes until crumb is browned. 4. Once cooked, remove from the oven and serve among four bowls. Dollop on cream to serve. Gluten-free option: Replace oats with quinoa flakes. Dairy-free option: Replace butter with coconut oil.